The Virginia Department of Transportation (VDOT) will host a planning workshop to gather input from the public on bridge options and design details for the W&OD Trail Pedestrian and Bicycle Bridge over U.S. Route 29 (Lee Highway), which will be built as part of the Transform 66 Inside the Beltway Eastbound Widening Project. The workshop will be on Wednesday, April 5, from 6:00-8:00 p.m., at Yorktown High School, 5200 Yorktown Boulevard, Arlington. VDOT will hold a short presentation beginning at 6:30 p.m. followed by a public participation session. There are local concerns about the bridge’s location, look, and impact on development. 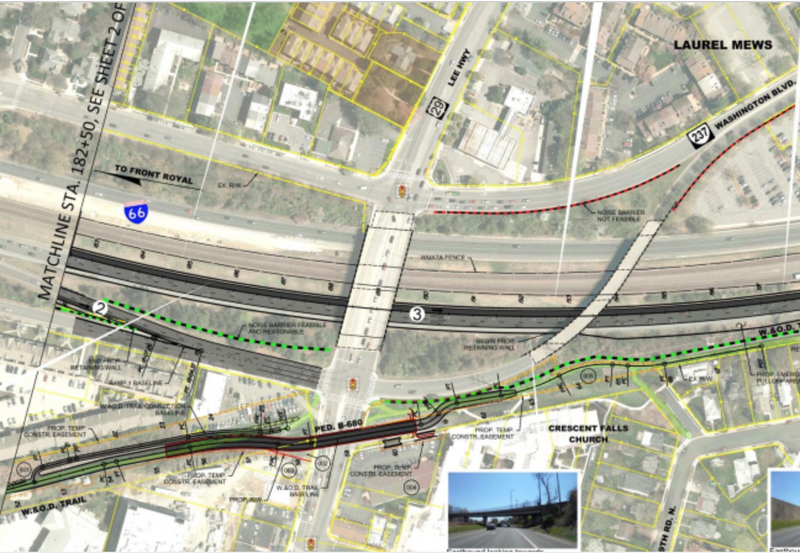 Alternatives have been proposed, such as taking the trail along Four Mile Run and under Lee Highway through an existing box culvert or adding a grade-crossing of Fairfax Drive and then taking the trail along I-66. The final choice for the bridge also will have impacts on the regional trail network.